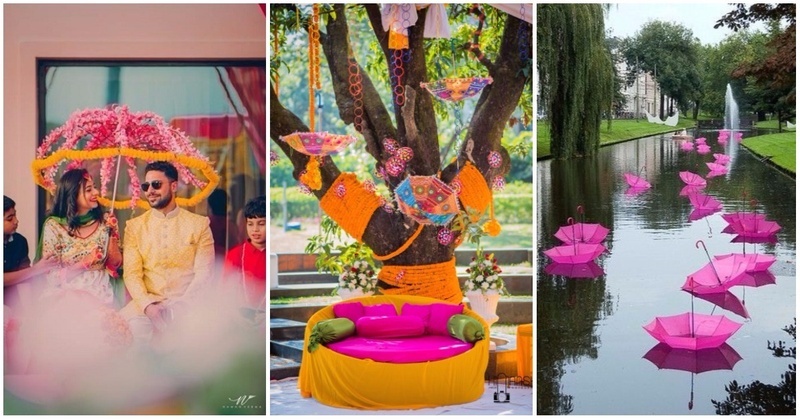 8 Cool Ways To Use Umbrellas As Decor At Your Indian Wedding! Hang them overhead in creative ways. You can experiment with the size, shape and pattern! Though bright, colourful ones work best for a mehndi function and for a wedding, follow your wedding theme! Scatter a bunch of upturned umbrellas in a pool, if you have one at the wedding venue. You can decorate it with flowers or any other suitable item! Another centrepiece idea, except it’s overhead! Transparent umbrellas brimming with colourful flowers look so beautiful. If you can’t get your hands on transparent ones, not a problem. You can use opaque umbrellas that are overflowing with flowers and hung lower! These florally decorated props look great for a bridal entry at your mehndi function. Wedding photobooths look super-cute with a bunch of colourful umbrellas in various styles. Decorate a tree with some umbrellas! Make sure they are bright and colourful enough so they stand out against the background. Whoever said wedding favours can’t double up as wedding decor! Just place them aesthetically.